In healthcare facilities, business growth and enhanced patient care are often fueled by technology innovation. According to hospital C-suite executives polled for Premier’s Fall 2015 Economic Outlook survey, more than 64 percent of respondents reported an increase in capital budgets for investments in advanced technology to meet value-based healthcare goals. Healthcare facilities and operations personnel play a key role introducing technology innovations to these healthcare executives. However, achieving buy-in from executives in order to fund technology upgrade projects requires considerable skill. A critical success factor is the ability to communicate how new technology features and benefits translate into business value. Healthcare executives often express frustration their staff loses them in detailed discussions surrounding watts per square foot, human machine interfaces, and protocol convergence. Oftentimes, those discussions end with facilities and IT teams failing to acquire the funding they need to move technology innovation forward. The language problem is compounded by the fact that the benefits of innovation are often invisible or gradual. “Smart” monitoring systems that manage the performance of a hospital, for example, are unseen by most of the organization’s employees. Yet this “behind the wall” innovation builds profit through hospital operational efficiency, business continuity, and connectivity-inspired business productivity gains. In any facility infrastructure discussion, healthcare executives often focus on three main points: reliability, traceability, and liability. They want to ensure that hospital systems are as reliable as possible, to reduce any failures in the emergency system. Through the use of accurate tracking tools, they want to ensure traceability so that, should an unanticipated incident occur, proof can be provided that the healthcare facility acted according to safe, legal and ethical practices. They also want to ensure they can show the events that led up to any failure in case of litigation, and to protect the hospital from liability. They have to rely on the facility manager to ensure the system is reliable and that appropriate reports are being created, but generally don’t have much insight into what is being done or whether it is sufficient. This is where facilities and IT teams can provide guidance. Facility and IT teams need to also communicate the cost of inaction when outdated technologies are not replaced or upgraded. Estimated cost of downtime for healthcare facilities, for example, is approximately $636,000 an hour on average (and this does not take into account the impact of potential deaths caused by emergency power supply failures). Healthcare facilities have experienced hundreds of millions of dollars in lost revenue from cancelled services, legal liability, and damaged reputations as a result of unanticipated downtime. Technology innovation will provide a positive ROI in several ways. Just upgrading to stand-alone intelligent controllers, for instance, can reduce lighting expenses by as much as 40%, and cut overall energy costs by 20% or more. With full Building Management System (BMS) implementations, savings of 30% and more are not uncommon. It is possible for healthcare executives to achieve their objectives of superior patient care and satisfaction, a safe environment for patients and staff, positive financial performance, and long-term productivity. They just need their IT and facilities staffs to properly articulate how the new technologies achieve these objectives. 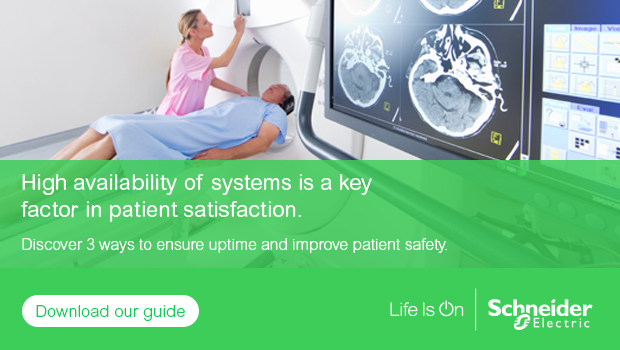 To learn more, download the recently released Schneider Electric guide entitled “A Practical Guide to Ensuring Business Continuity and High Performance in Healthcare Facilities”.